A loan of $200 helped to build a clean water sources facility at their home to improve access to water sources for their family. Good day lenders! Meet one of KSPPS BMI’s clients, Utiyah, who is 31 years old and married. She has one daughter. Utiyah has been selling clothes such as pants, skirts, shirts, jackets, etc for two years. Her husband works very hard; he has worked in a motorcycle workshop in the Serang District for 10 years. Their income is barely enough for basic needs. They would like to improve their living conditions and create a happy and healthy life for their kid. She has asked for a loan of IDR 2,500,000 from KSPPS BMI. This loan will be used to build a clean water sources facility at their home to improve access to water sources for their family. Today, her family has no access to a water sources in their home and must rely on the river for bathing. Her family income is insufficient to build water sources, but Utiyah will be able to repay the loan received. She and her family want to live a healthy life with clean water. She is very grateful for the opportunity, and wants to thank all lenders. It helps prevent the spread of disease by providing access to clean drinking water and sanitation. 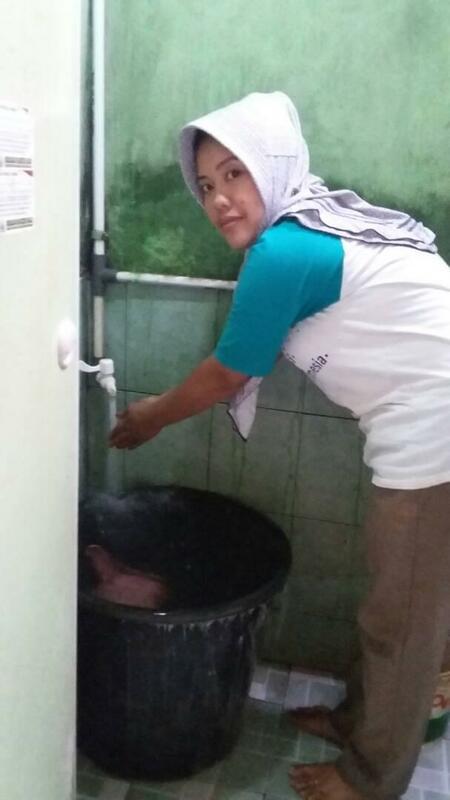 This water and sanitation loan is part of BMI's effort to improve the living standards of communities in west Jakarta in the Tangerang area of Banten province. Today, many Indonesian homes do not have access to safe water or sanitation facilities. With few hygienic alternatives available to them, families often face water pollution resulting in respiratory, gastrointestinal or skin diseases as well as river pollution due to illegal sewage piping. By partnering with Kiva, BMI helps clients access key resources to build latrines, septic tanks and water tanks. By funding this loan, you are playing an important role in helping Indonesian communities protect themselves from diseases, and improving their living conditions. Koperasi Syariah Benteng Mikro Indonesia's (BMI) mission as a Cooperative is to contribute to the economic well-being and empowerment of its members through its savings and syariah loan program, manage the Cooperative with professionalism, provide an excellent service to its members and help create job opportunities for members and their families. With the help of Kiva, BMI provides loans that will enable borrowers to build clean water and sanitation facilities for their households and improve the health of their communities. Kiva supports BMI's s mission to improve the health of communities who lack access to clean water and sanitation. The cost of borrowing in Indonesia is extremely high for MFIs which makes Kiva's funding important to promote innovative, affordable and high impact initiatives.